NetApp FAS arrays provide excellent means for provisioning storage for your CIFS, NFS, iSCSI and FCP clients. IntelliMagic Vision provides a single pane of glass for monitoring the health of your entire SAN / NAS infrastructure including NetApp storage systems. Monitoring for multi-vendor storage arrays from HPE, IBM, Dell EMC, Infinidat, and others. Front-end performance health via the logical resources, such as the FlexVols, their associated Aggregates and the protocols that are used to connect to and through them. Detailed performance view of the back-end resources from the Aggregates to their associated Plexes and RAID Groups. Easy monitoring of applications using groups of Flexvols or LUNs to determine their performance and capacity demands. IntelliMagic’s unique approach allows you to see if there are any performance constraints within your NetApp infrastructure and leverages built-in configuration correlation to allow you to quickly drill down to the root cause. The ability to quickly traverse the configuration in a performance context is unique to IntelliMagic Vision and allows you to quickly identify potential issues and get down to root cause without waiting for vendor analysis of your data. The Configuration Report Set allows the user to see all of the NetApp systems configuration in a single pane of glass. The Service Statistics reports are designed to quickly highlight any component level bottlenecks within the Disk, processor and ports and to see who is driving the load. 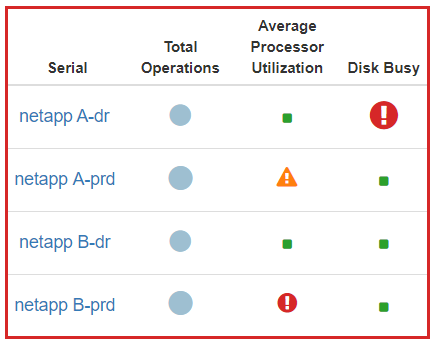 The Balance charts are designed to show you any performance imbalances within the physical components of your NetApp systems. The Health Dashboards provide a simple way to identify if there are any Processor or Disk constraints and whether or not these are leading to any protocol constraints. The All Protocols Report Set allows you to see how your NetApp systems are performing across all the protocols for I/O and latency metrics. The Front-End report set shows all of the traffic between the hosts and the NetApp systems whether it comes through the network interfaces or the fibre channel interfaces.